Dr. Marcus has a special personal interest in treating sports-related injuries of the foot and ankle. As a marathon runner himself, Dr. Marcus has participated in a number of national competitions and is uniquely familiar with the injuries which can result from serious training and competition. Even if you're not a competitive athlete, but experience problems related to exercise, Dr. Marcus can identify any problems you may be having and develop a treatment plan to help minimize your discomfort and speed recovery. 12. Biomechanical problems of the lower extremity, i.e. "runners knee"
Prior to the initiation of treatment, Dr. Marcus will carefully evaluate your condition. This includes obtaining a thorough medical history and performing a detailed examination of your problem. Various diagnostic tests are available to diagnose your specific disorder including x-rays, bone scans, CAT scans and M.R.I. 's which allow for detailed views of bones or soft tissues. Once diagnosed, Dr. Marcus utilizes various approaches to treat your problem. In all cases, Dr. Marcus' focus is on early return to activity and prevention of recurring injury. A well-made running shoe is one of the most important aids for preventing and treating running injuries. No one shoe is ideal for all runners. There are several factors that influence the shoe type. These include, but are not limited to the following: a. foot-type, (whether the patient prorates their foot, or whether he or she is a supinator); b. the patient's weight; c. the running surface; d. distances or miles covered; e. whether deformities in the foot exist; and f. many new design features have provided running shoes with improved shock absorption, improved stability as well as motion control, cushionings and flexibility, together with new designed features, running shoes in general have become lighter in weight. Our clinical impression at this time is that of flexible prorated foot generally requires a motion-controlled type of shoe. The more rigid or high arch or cavus foot-type we see, the more flexibility is required and less motion control needed. Regardless of the foot-type, all training shoes should have excellent shock-absorbing quality, such as, a. EVA, (ethylene vinyl acetate) of various densities; b. encapsulated polyurethane; and c. Gels. Just as contact lenses improve vision, orthotics improve the function of the foot. They are often custom-made inserts. An impression of the foot is taken with either plaster or foam. The laboratory then constructs the orthotic based on the prescription and directions from the podiatrist. They generally can be transferred from one shoe to another. They are made to control the way the foot functions, as well as for accommodation of your specific foot problems, i.e. painful callous on bottom of foot and or metatarsal prominence. In runners, orthotics are constructed in order to be placed in a running shoe. They are used in order to compensate for the athlete's biomechanical problems. These custom-made supportive devices prevent abnormal movements in the foot and lower extremity during the running cycle. In the prorated foot, these devices maintain the foot in a more neutral position; thereby preventing excessive abnormal inner-rotation of the foot. In the high arch foot, orthotics generally are made to provide support of the arch of the foot, as well as provisions to allow for a greater amount of shock-absorption within the lower extremity. Some foot problems require more control; others require more shock absorption and cushion. The precise mix is determined by your doctor. There are many indications for orthotics, such as metatarsal problems, neuromas, painful calluses, pain from plantar fascitis, flatfoot deformities and many other problems of the foot or ankle. They may also prove to either delay the need for surgery as well as help prevent the reoccurrence of various conditions. There exists a continuum with reference to stresses that are applied on tissues. For example, if a tendon is allowed to continue bearing a greater than normal amount of load, the tendon eventually becomes inflamed resulting in a Tendonitis. As this condition increases, the tendon can possibly go through more of a breakdown, eventually leading to a partial rupture. This of course, could eventually proceed to a full rupture. When inflammation of a tendon adjacent to a bone increases, a periosteal reaction could then develop. If this load increases, the pressure and forces applied to the bone will subsequently increase, which can then cause a perforation in the outer cortex of the bone which results in a stress fracture. Therefore, a continuum exists with reference to allowing overuse to occur of basically any of the tissues in the extremity that we are dealing with. Stress fractures in runners are very common, and their incidence appears to be increasing. It is for this reason that this condition needs to be clearly understood by all serious (frequent and regular) runners. Understanding the injury and what predisposes one to it may lead to prevention. Stress fractures constitute between 6-10% of the most common running injuries. Women are more prone to the stress fractures than men. Stress fractures are best described as an alteration of bone that occurs secondary to repetitive abnormal forces. Therefore, stress fractures are due to repetitive stress due to increased load after fatigue of the supportive structures. Muscle forces ,which act across and on the bone, exceed the stress-bearing capacity of the bone. These abnormal forces cause progressive micro-fractures, hence a stress fracture develops. Almost any bone can be stressed, but the most common in runners are the tibia (shinbone), fibula (outer anklebone), metatarsals (long bones at the base of the toes), and the femur (thighbone). The clinical symptoms and presentation that runners usually present included localized pain and tenderness to a specific site. Sometimes, mild swelling occurs. The pain is aggravated with running, and classically subsides with rest. Depending upon the level of running of the athlete, various histories are related. For example, the novice runner will often relate to me that he or she has suddenly stepped up their weekly mileage in order to possibly compete in an event. Whereas more experienced runners often inform me that they have had a chronic injury for months, possibly years, i.e. shin splints, and now the symptoms have become more disabling. The diagnosis of a stress fracture can be difficult, both clinically, and even radiographically, that is with x-rays. The physician treating the athlete must have a high index of suspicion. Plain x-rays do not show stress fractures, as they do the more classic acute fractures. Since stress fractures are micro-fractures, the only time they are visualized on plain x-rays, is when healing of the bone fractures become visible. That is, when bone callous actually develops. This usually occurs around 2-3 weeks following the onset of the initial symptoms. Bone scanning, however, could be utilized to detect these fractures as early as 2-8 days after the symptoms develop. Early detection is paramount, based on clinical experience and suspicion. Radiological findings should be de-emphasized, in order to initiate early treatment and rehabilitation and thus prevent progression of the problem. The treatment depends on the location of the stress fracture, as well as the duration of the symptoms. For example, a displaced femoral thigh bone, neck fracture, may require immediate surgical intervention to prevent further applications, whereas some more simple metatarsal type fractures may require reduced running mileage, and possibly an orthosis (depending upon the cause of the problem). 1. Reduction of running mileage. 2. Substitution for running (other aerobic activity, i.e. biking). 6. Orthotics or a shoe modification to reroute the stresses. In order for this condition to be most efficiently treated, the physician needs a high index of suspicion in order to prevent progressive pain and disability. It is then of equal importance that the patient possess the understanding and cooperation that is needed to follow the recommendations of the treating physician. When in training it is also recommended to consult an experienced coach. In the Orange County area, we recommend to visit "the coach" Bill Sumner. 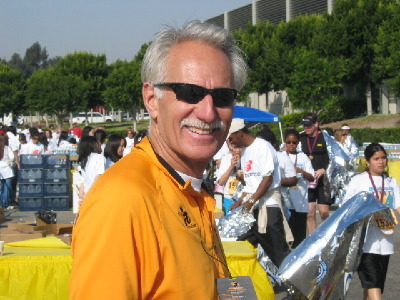 Bill is a national recongnized runner and marathoner who has been an instrumental coach in many ways to thousands of students both young and old. 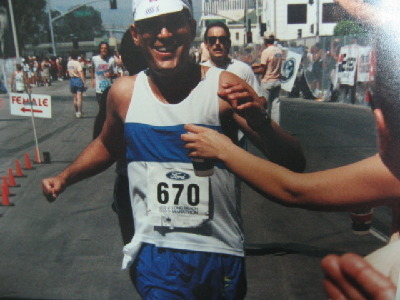 He is currently the the coach for Corona Del Mar's track and cross-country team, where he has been for over 20 years. 4. Changes in running style, whether associated with shoe gear, terrain, speed or distance. 6. Chronic overload of bone associated with soft tissue injuries (example: tendinitis, shin splints, strains, and sprains). Therefore, stress fractures are due to repetitive stress due to increased load after fatigue of the supportive structures. Muscle forces, which act across and on the bone, exceed the stress-bearing capacity of the bone. These abnormal forces cause progressive micro-fractures, hence a stress fracture develops. Almost any bone can be stressed, but the most common in runners are the tibia (shinbone), fibula (outer anklebone), metatarsals (long bones at the base of the toes), and the femur (thighbone). The clinical symptoms and presentation that runners usually present included localized pain and tenderness to a specific site. Sometimes, mild swelling occurs. The pain is aggravated with running, and classically subsides with rest. Depending upon the level of running of the athlete, various histories are related. For example, the novice runner will often relate to me that he or she has suddenly stepped up their weekly mileage in order to possibly compete in an event. Whereas more experienced runners often inform me that they have had a chronic injury for months, possibly years, i.e. shin splints, and now the symptoms have become more disabling. The diagnosis of a stress fracture can be difficult to see, both clinically, and even radiographically, that is with x-rays. The physician treating the athlete must have a high index of suspicion. Plain x-rays do not show stress fractures, as they do the more classic acute fractures. Since stress fractures are micro-fractures, the only time they are visualized on plain x-rays is when healing of the bone fractures become visible. That is, when bone callous actually develops. This usually occurs around 2-3 weeks following the onset of the initial symptoms. Because of this, bone scanning as well as MRI can be utilized in early detection of stress fractures. A well-made running shoe is one of the most important aids for preventing and treating running injuries. No one shoe is ideal for all runners. There are several factors that influence the shoe type. These include, but are not limited to the following: a. foot-type, (whether the patient prorates their foot, or whether he or she is a supinator); b. the patient's weight; c. the running surface; d. distances or miles covered; e. whether deformities in the foot exist; and f. many new design features have provided running shoes with improved shock absorption, improved stability as well as motion control, cushioning and flexibility, together with new designed features, running shoes in general have become lighter in weight. Just as contact lenses improve vision, orthotics and insoles improve the function of the foot. efootdoctor recommends three different levels of orthotics; a more flexible and flat foot requires a more rigid and controlling device, whereas a higher arch, more rigid foot requires an insole or support that allows for some control but mostly a greater amount of shock absorption. Some runners may require custom-made orthotics. These are created after the physician obtains either a plaster or foam impression of the foot. As technology increases, scanning of the foot will become the preferred method for creating orthotics. The laboratory then constructs the orthotic based on the prescription and directions from the physician. They are made to control the way the foot functions, as well as for accommodation of your specific foot problems, i.e. painful callous on bottom of foot and or metatarsal prominence. In runners, orthotics are constructed in order to be placed in a running shoe. They are used in order to compensate for the athlete's biomechanical problems. These custom-made supportive devices prevent abnormal movements in the foot and lower extremity during the running cycle. There are many indications for orthotics and insoles, such as metatarsal problems, pain in the ball of the foot, neuromas, painful calluses, pain from plantar fascitis, flatfoot deformities, and many other problems of the foot or ankle. They may also prove to either delay the need for surgery as well as help prevent the recurrence of various conditions. The general treatment for an overuse syndrome depends on the location of the problem as well as the duration of symptoms. For example, a heel bone stress fracture will require appropriate casting and non-weight bearing whereas some simpler metatarsal stress fractures and mild tendinitis conditions may only require reduced running mileage. 3. Substitution for running (i.e. biking, swimming, yoga). Please be informed that proper running shoes are extremely important in prevention of many of the running injuries that have been mentioned in the above paragraph. Also, please be aware that alternating the running shoe and being conscious as to the amount of miles actually run on them, is of great importance. Depending upon which authority one speaks with, approximately 300 miles on a pair of running shoes is probably maximum. Even though shoes may look as if they are structured well after a certain amount of running they lose their ability to provide adequate shock absorption and, therefore, can cause increased stresses to various parts of the body.